A slim and discreet pad designed for light incontinence featuring a new compressed core for super thinness. 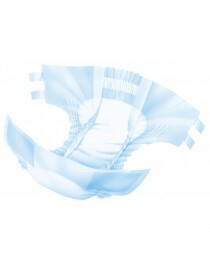 The Attends Soft 2 Normal Pads are designed to be slim and discreet, and insert into men’s underpants. They protect against mild or very light incontinence issues. 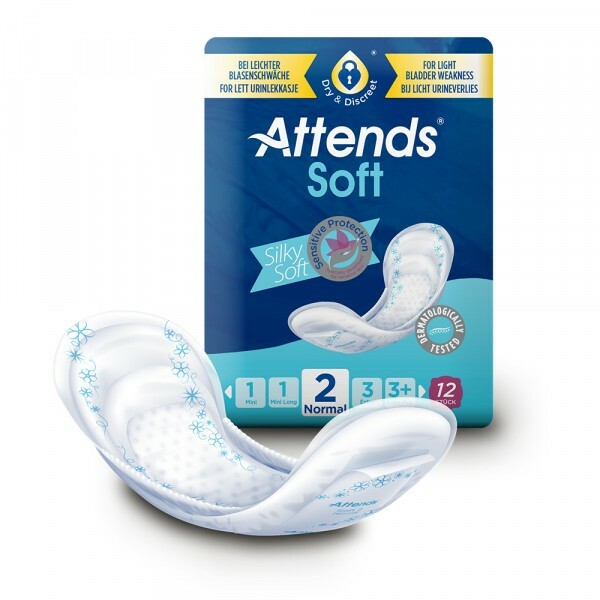 These Attends are also super soft, and feel like natural fibres against the skin that maximize comfort, and help the wearer to forget they’re incontinence pads. The Attends Soft 2 Normal Pads feature a white pad with blue stars for design. They are in a cupped U-shaped design to fit anatomically around the body. These Attends are designed for temporary or longterm issues of urinary incontinence due to illness, or disease for men. If the patient has heavy or severe urinary or faecal incontinence then one of the other Attends products may be more appropriate. There are also other Attends products that provide for mild incontinence care for women. This is a discreet pad to be worn for mild incontinence. It’s slender and not discernible under clothing. There is odour protection, so even if the bladder leaks, the fluids will be trapped inside. This helps to keep odours in check too, as often they starting smelling bad with exposure to air or skin. The odour protection also works to mask smells, and will provide long-lasting freshness. The pads have a breathable textile backing that helps to keep skin soft dry, and healthy. It will feel like wearing normal clothing so that it doesn’t irritate skin. The interior contains a compressed core that attracts more fluids and keeps it in less space. This keeps the Attends Soft 2 Normal Pads slimmer so they’re more discreet under clothing. The pads attach to underpants with a strong fixation tape. They’ll stay in place through all normal activities. When they are ready to be discarded, they can be lifted out, folded up, and placed into a waste bin. The adhesive on the tape will not leave behind any sticky residue on clothing. The Attends Soft 2 Normal Pads are designed to be inserted into stretchy and tight fitting underwear, rather than boxer shorts. There are 12 units per pack of Attends Soft 2 Normal Pads. Each Attends pad has an absorbency range of 499m. • Suitable for mild or light incontinence. • Discreet shape hides under clothing.